Transgenic mouse lines were generated that express the Cre recombinase under the control of the distal promoter of the mouse Lck gene. Cre recombination in four of these lines of transgenic mice was characterized at the single cell level using ROSA26-regulated loxP-Stop-loxP-βgeo and loxP-Stop-loxP-YFP reporter mouse lines. Two of the lines showed T cell-restricted Cre recombination, whereas the other two also expressed Cre in B cells, NK cells, and monocytes. Cre recombination began at a late stage of T cell development (at or after up-regulation of the TCR during positive selection) in the two T cell-restricted lines. Lines of mice that express the Cre recombinase at late stages of thymocyte development are of value for determining the impact of mutations on T cell function in the absence of complicating effects on early thymocyte selection. The development of T lymphocytes is a well described multistage process. It begins with the seeding of the thymus by hemopoietic progenitor cells, and ends with the emergence of naive postthymic cells that can be activated by Ags to become effector and memory T cells (1, 2). While resident in the thymus, immature cells undergo successive episodes of V(D)J rearrangement that allow for surface expression of precursor, αβ or γδ TCRs. Signaling from these receptors is mediated by common signaling molecules such as the CD3 and TCRζ chains, the Syk/ZAP-70 and Fyn/Lck protein tyrosine kinases, enzymes in the phosphatidylinositol and calcium pathways, downstream adaptors such as SLP-76, MAPK signaling relays, and transcription factors that include NFAT proteins and NF-κB family members (3). Although the signals delivered by T cell receptors through the above molecules are essential for immune responses, they are also critical for passage through several genetically defined developmental checkpoints (1). Furthermore, it is becoming increasingly clear that TCR signaling helps regulate the postdevelopmental proliferation and survival of mature T cells in the absence of infection (4, 5, 6, 7, 8, 9, 10, 11). Thus, mutations that interfere with TCR function at any level have the potential to change the outcome of thymocyte development from an early stage and/or to alter peripheral T cell homeostasis. Systems that would allow for mutagenesis of T cells in a stage-specific fashion are therefore important for resolving the postdevelopmental functions of genes such as those that encode core TCR signaling proteins, or other proteins that are important at multiple stages in T cell development. One means to accomplish stage-selective mutagenesis of T cells involves the use of mice that express the Cre recombinase under the control of T cell-specific promoters (12, 13). Here, we describe a series of such transgenic mice that were generated using a cre transgene regulated by the distal promoter of the mouse Lck gene (14, 15). The four lines of transgenic mice we have characterized in detail show patterns of recombination that differ in their onset of expression and the range of cell types they affect. We show that two of these lines of mice have features that make them useful additions to the range of tools available for somatic mutagenesis of lymphocytes. dLck-icre transgenic mice were generated by pronuclear microinjection of DNA into C57BL/6xDBA/2 F2 eggs. The transgene was generated by insertion of a codon-optimized form of the cre open reading frame (referred to as icre) into a distal Lck promoter expression vector (14, 15). Transgenic founders were screened by Southern blot analysis, bred to mice carrying a conditional Cd4 allele (Cd4lox (16)) and either intercrossed, or back-crossed to Cd4−/− mice to generate Cd4lox/lox or Cd4lox/−dLck-icre mice. ROSA26-loxP-Stop-loxP-βgeo reporter mice (17) were obtained from Dr. S. H. Orkin (Harvard Medical School, Cambridge, MA) via Dr. R. Andino (UCSF, San Francisco, CA). ROSA26-loxP-Stop-loxP-YFP mice (18) were kindly provided by Dr. F. Costantini (Columbia University, New York, NY). All mice were housed in the Parnassus Heights pathogen-free barrier facility at University of California, San Francisco. dLck-icre transgenic mice and ROSA26-loxP-Stop-loxP-βgeo reporter mice were typed by Southern blot and/or PCR using icre (5′-ATGGTGCCCAAGAAGAAGAG and 5′-CAGGTGCTGTTGGATGGTCT) or puro (5′-GTCACCGAGCTGCAAGAACT and 5′-CGGGTCATGCACCAAGTG) primers, respectively. ROSA26-loxP-Stop-loxP-YFP mice were typed by multiplex PCR using primers originally designed in the laboratory of Dr. P. Soriano (Fred Hutchinson Cancer Research Center, Seattle, WA) (5′-GCGAAGAGTTTGTCCTCAACC-3′, 5′-GGAGCGGGAGAAATGGATATG-3′, and 5′-AAAGTCGCTCTGAGTTGTTAT-3′). Recombined and unrecombined alleles of the ROSA26-loxP-Stop-loxP-YFP allele were detected in genomic DNA by multiplex PCR using the following three primers: 5′-AAGGGAGCTGCAGTGGAGTA-3′ (UPS); 5′-GCCAGAGGCCACTTGTGTAG-3′ (PGK); 5′-TGGTGCAGATGAACTTCAGG-3′ (YFP). FITC-, PE-, or TC-conjugated Abs were purchased from CalTag Laboratories or BD Pharmingen. The fluorescent β-galactosidase substrate fluorescein digalactopyranoside (FDG)3 was obtained from Molecular Probes. Bone marrow cells (0.3 × 106), lymphocytes, or thymocytes were incubated for 30 min on ice in a volume of 25 μl of FACS buffer (PBS with 0.3% BSA and 0.01% NaN3) containing Abs at saturating concentrations. The cells were washed twice in FACS buffer, stained with secondary reagents as necessary, washed again, and then analyzed using a FACScan flow cytometer (BD Biosciences) and CellQuest or Flowjo software. To detect βgeo activity by flow cytometry, 3 × 106 cells were washed once with PBS, then resuspended in 60 μl of PBS. FDG was diluted in water to 7.5 mM from a 100 mM stock solution. The cells and FDG were warmed to 37°C for 5 min then 40 μl of FDG were added to 60 μl of cells. The mixture was incubated at 37°C for 5 min before adding 1 ml of ice-cold PBS. The cells were placed on ice for 5 min, then transferred to a 15°C water bath for 15 to 30 min. Finally, the cells were pelleted by centrifugation, resuspended in FACS buffer, and stained with fluorescent Abs before FACS analysis. To detect Cre in permeabilized cells by FACS, 2–5 × 106 cells were stained with appropriate antibodies, washed once in PBS, then resuspended in 1 ml of PBS. The cells were fixed by the addition of 1 ml of 4% paraformaldehyde in PBS and incubation at room temperature for 20 min. After washing twice with PBS, the fixed cells were resuspended in 50 μl of saponin buffer (0.5% saponin in PBS with 0.3% BSA and 0.01% NaN3; Sigma-Aldrich) containing 7% normal goat serum (Jackson ImmunoResearch Laboratories) and incubated at room temperature for 15 min. Anti-Cre mAb 7.23 (50 μg/ml; Covance Research Products) was then added to the permeabilized cells, and they were incubated at room temperature for another 20 min. The cells were washed twice with saponin buffer and stained with FITC-goat-anti-mouse IgG (BD Pharmingen) in saponin buffer for 20 min at room temperature. Finally, the cells were washed twice in saponin buffer and resuspended in FACS buffer for analysis using the FACScan. Either 50 × 106 thymocytes or lymphocytes were lysed in 250 μl of buffer containing 20 mM Tris-HCl, 137 mM NaCl, 2 mM EDTA, 1 mM PMSF, 10 μg/ml leupeptin, 10 μg/ml aprotinin, and 1% Nonidet P-40. Insoluble material was removed from the lysates by centrifugation. After preclearing with 25 μl of packed goat anti-mouse IgG agarose beads (Sigma-Aldrich), the Cre protein in the lysates was immunoprecipitated using 2.5 μl of the anti-Cre mAb 7.23 (1 mg/ml; Covance Research Products) and 25 μl of fresh beads. The immunoprecipitates were then fractionated by SDS-PAGE, transferred to Immobilon-P membranes (Millipore) and blotted with a rabbit anti-Cre polyclonal Ab B4197 (gift of Drs. U. Muller and L. Reichardt, UCSF) using an HRP-conjugated donkey anti-rabbit Ig antiserum (Amersham Biosciences) and ECL detection reagents (Amersham Biosciences). Supernatants from the above Cre immunoprecipitations were re-cleared with 25 μl of protein A-agarose beads (Invitrogen Life Technologies), and then re-immunoprecipitated with 2.5 μl of anti-ZAP-70 polyclonal Ab R1600 (gift of Dr. A. Weiss, UCSF) and 25 μl of fresh protein A-agarose beads. After SDS-PAGE and transfer to Immobilon-P membranes, the immunoprecipitated ZAP-70 protein was detected by blotting with R1600, HRP-conjugated donkey anti-rabbit Ig, and ECL reagents. In an attempt to direct expression of the Cre recombinase to late stages of T cell development, we generated a cre transgene regulated by the distal promoter of the mouse Lck gene (14, 15) (Fig. 1⇓A). This construct was used to make fourteen transgenic founders that were test mated to mice carrying a loxP-containing conditional allele of the Cd4 gene (16). The pattern and extent of Cre recombination in these mice was then assessed by Southern blot using a Cd4 probe on DNA taken from their tails, spleens, lymph nodes, and thymuses. As shown in Fig. 1⇓B, a spectrum of effects was observed: in some cases (e.g., lines 4423, 4425, and 3780), there was evidence of extensive recombination in the thymus and in secondary lymphoid tissue; in other cases (e.g., lines 3800 and 3778), recombined alleles were infrequent in the thymus but clearly detectable in the lymph nodes or spleens. Seven of the lines were selected for further breeding based on this preliminary screen. One of the lines was later shown to contain two transgene insertion sites that segregated independently (data not shown), and these were maintained as independent stocks (3778 and 3779). Of the six other lines, we eventually focused on two (4430 and 3785) that demonstrated a high level of recombination in T cells by the assays described below. A, Design of the dLck-icre transgene. A codon-optimized cre open reading frame (icre) was placed downstream of the distal Lck promoter. Human growth hormone (hGH) exons in the construct allow for splicing to improve transgene expression (24,25 ) and also to provide a transcriptional terminator. B, Representative Southern blot assay for recombination at the Cd4 locus in dLck-icre transgenic lines. DNA was prepared from the tails, thymuses, and lymph nodes of dLck-icre transgenic Cd4lox/+, digested with SacI and hybridized with a probe from the first intron of the Cd4 gene, as described (16 ). The asterisks identify some of the lines that were selected for further breeding based on this assay. In addition to the Southern blot assay just mentioned, we also followed Cre expression in the lines of mice by four other procedures. One was to monitor loss of CD4 expression on T cells in mice that had two copies of a conditional null Cd4 allele, or one copy of the conditional allele balanced by a null allele (16). Although these experiments provided useful data that were entirely consistent with other assays (data not shown), the loss of CD4 expression was evident only in cells that normally would have expressed CD4. Moreover, the loss of CD4 also changed the outcome of thymocyte development and peripheral T cell homeostasis (16) limiting the value of this allele for detailed analysis of Cre expression patterns. We therefore crossed the cre transgenic lines to mice carrying either a loxP-Stop-loxP-βgeo or a loxP-Stop-loxP-YFP element inserted into the ROSA26 locus (17, 18) in search of a more general means of assessing when the Cre recombinase was expressed. 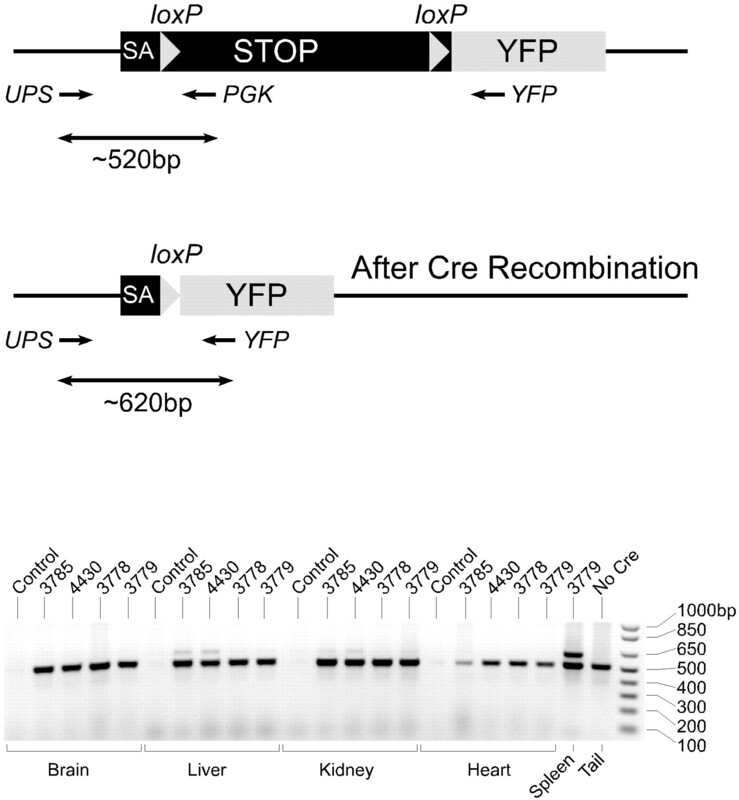 Cre recombination at these ROSA26 reporter alleles causes excision of a loxP-flanked disruption (the “Stop” element) and allows for βgeo or YFP to be produced under the control of the broadly active ROSA26 cis-acting sequences (19). βgeo- or YFP-expressing cells in the cre transgenic reporter mice could then be identified by FACS analysis (using FDG as a fluorescent substrate in the case of βgeo) (20). Cre expression was also monitored directly in the transgenic mice by immunoprecipitation and immunoblotting using Cre-specific monoclonal and polyclonal Abs, and by intracellular FACS using a Cre-specific mAb (21). Of the various techniques we used, FACS analysis of cells from the cre transgenic ROSA26 reporter mice was the most informative because it gave clear single-cell resolution concerning the onset of Cre activity. Western blot analysis suggested that there was enhanced expression of Cre in the lymph nodes vs thymuses of lines 4430 and 3778 (data not shown), but the magnitude of this effect was difficult to judge, and the experiments we performed did not involve purification of the different cell types present in peripheral lymphoid tissue. Intracellular FACS analysis for Cre showed clear recombinase expression in several lines and allowed for limited single-cell discriminations to be made (data not shown). However, the sensitivity of this assay was not high, and by contrast, the Cre-recombined ROSA26 reporter loci reproducibly gave much stronger fluorescent signals in all of the cell types we examined (Figs. 2–4⇓⇓⇓). Flow cytometric analysis of βgeo or YFP expression in thymocytes from dLck-icre transgenic mice carrying the ROSA26-loxP-Stop-loxP-βgeo or ROSA26-loxP-Stop-loxP-YFP reporters, respectively. βgeo expression was detected by loading cells with FDG as described in Materials and Methods. In the top panel (labeled “Thymocytes”), cells from the two types of reporter mice were costained with an Ab specific for the β chain of the TCR or an Ab specific for CD3ε to identify cells at different stages of development (cell surface expression of TCRβ/CD3 increases with the developmental maturity of thymocytes). The panel labeled “YFP+ Thymocytes” shows the frequencies of HSA+ cells in the YFP+ populations in the different lines of icre mice (HSA expression decreases with thymocyte developmental maturity). The panel labeled “YFPint Thymocytes” shows the frequencies of HSAhigh blasts and HSAlow small cells that express intermediate levels of the YFP reporter; intermediate expression of the YFP reporter identifies cells that have recently undergone Cre recombination. The frequencies of YFPint thymocytes in the different thymuses are shown at the top of the contour plots (i.e., 1.4%, 1.5%, 5.8%, and 30% for lines 3778, 3779, 4430, and 3785, respectively). 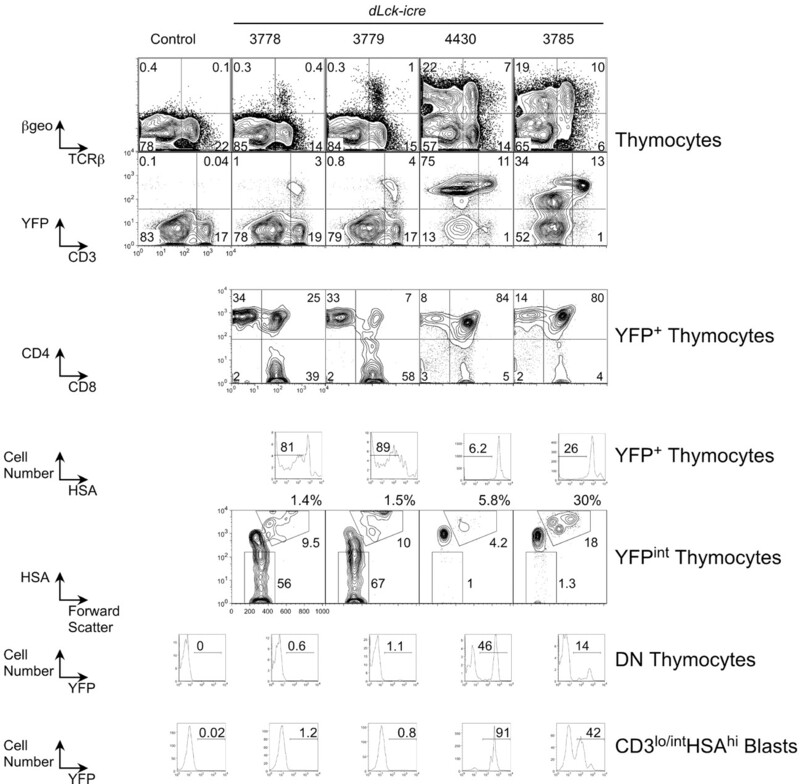 YFP expression in CD4−CD8− thymocytes is shown in the panel labeled “DN Thymocytes,” and similarly, YFP expression in CD3lo/intHSAhigh blasts is shown in the panel labeled accordingly. Flow cytometric analysis of βgeo or YFP expression in T cells from dLck-icre transgenic mice carrying the ROSA26-loxP-Stop-loxP-βgeo or ROSA26-loxP-Stop-loxP-YFP reporters, respectively. Frequencies of reporter-expressing CD4+ or CD8+ lymph node T cells are shown in the contour plots of representative icre+ reporter+ mice. Flow cytometric analysis of βgeo or YFP expression in non-T cells from dLck-icre transgenic mice carrying the ROSA26-loxP-Stop-loxP-βgeo or ROSA26-loxP-Stop-loxP-YFP reporters, respectively. A, The contour plots show expression of YFP in NK cells, B cells, and monocytes from the spleens of the different lines of mice. NK cells were identified by expression of DX5 and absence of CD3. B cells were identified by expression of B220 and monocytes by expression of Mac-1. B, The histograms show the frequencies of βgeo-expressing B cell populations (solid lines) in the bone marrow and lymph nodes of line 4430. The dashed curves show staining for βgeo in cells from an icre− littermate. B cell populations in the bone marrow were defined on the basis of varying expression of the B220 and CD43 markers. Thymocyte populations from the four cre transgenic/reporter mouse lines were analyzed by multicolor flow cytometry as shown in Fig. 2⇑. In general, the same qualitative conclusions could be drawn using data from the analysis of either the βgeo or YFP reporter lines. The YFP data were found to be more reproducible because in contrast to the βgeo mice, the generation of the fluorescent signal in cells from these mice was not dependent on the sometimes-variable penetration of the FDG substrate into cells. Line 4430 showed recombination of the reporter alleles from an early stage of thymocyte development (in CD4−CD8− thymocytes), and reporter expression remained high in all subsequent stages of development. Recombination appeared to occur at a later time point in line 3785 because a lower fraction of CD4−CD8− cells in mice of this line expressed YFP. Moreover, there were more cells expressing intermediate levels of YFP in line 3785 than in line 4430 (see “YFPint thymocytes” in Fig. 2⇑). Intermediate expression of YFP in mice such as these identifies cells that have recently undergone recombination at the reporter locus. This is apparent because as shown in line 4430, cells at all stages of thymocyte development have the capacity to express YFP at similar levels when the allele is recombined at an early stage of development. Of the thymocytes of line 3785, 30% expressed intermediate levels of YFP, and all of these expressed low/intermediate levels of CD3 on their cell surfaces. Approximately one-fifth of the YFPint cells also showed high forward scatter indicating that they were actively proliferating. 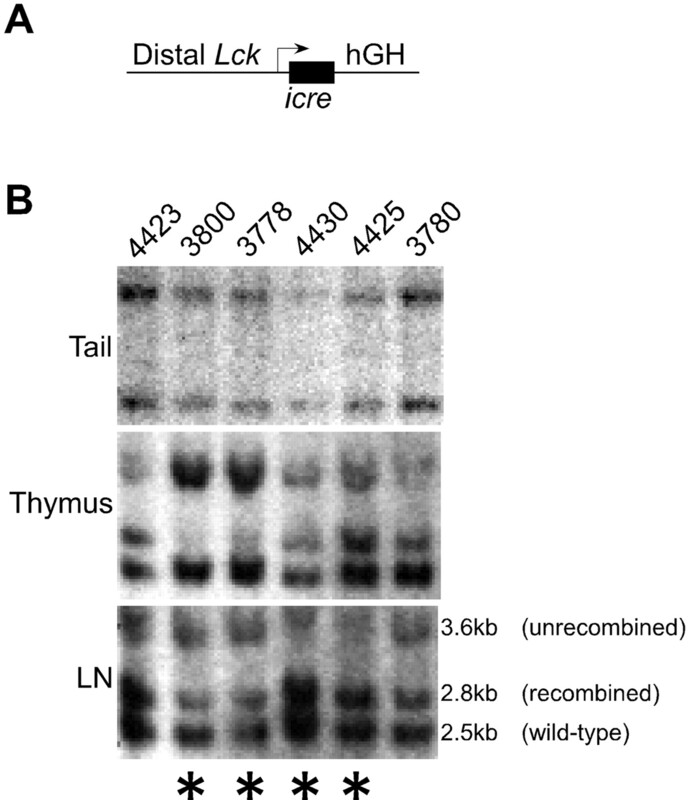 These characteristics indicated that the onset of recombination in the thymuses of line 3785 mice was primarily during the expansion of clones of TCRβ-expressing cells after deliverance of the pre-TCR signal. In contrast, the frequency of YFPint cells was 5-fold lower in line 4430 than in line 3785 and a lower fraction of these recently recombined cells were blasts (4% compared with 18%). Thus, recombination occurred primarily before the pre-TCR signal in line 4430 and after it in line 3785. We have not performed a more detailed analysis to identify the precise stage of development at which recombination begins in line 4430, and it remains possible that some (if not all) of the recombination occurs before entry into the thymus. Lines 3778 and 3779 showed similar patterns of recombination. In these mice, βgeo or YFP expression could only be detected in thymocytes that expressed high levels of the TCR, the majority of which were CD4+ or CD8+ single-positive cells (Fig. 2⇑). These reporter-expressing cells were enriched for low expression of the heat-stable Ag (HSA or CD24), again consistent with them being mostly mature single-positive cells. As would be expected, YFPint cells in lines 3778 or 3779 expressed much less HSA compared with the YFPint cells from lines 4430 or 3785. Double-negative cells, or HSAhigh CD3low/int blasts were negative for YFP expression. Cumulatively, these data indicated that recombination in lines 3778 and 3779 occurred at a late stage in T cell development after acquisition of the TCRα chain and expression of high levels of cell surface CD3 following positive selection. Of the four lines we examined in detail, peripheral T cells from lines 3785 and 4430 showed the highest proportions of YFP+ cells (Fig. 3⇑). Line 3779 was next with recombination being more penetrant across the CD8+ population of cells than the CD4+ population (∼90% vs ∼75% YFP+ cells, respectively). Consistent with the thymic data (Fig. 2⇑ and data not shown) line 3778 showed the lowest frequencies of recombined alleles in its peripheral T cell populations. Although Lck is a T cell-restricted gene, line 4430 showed clear evidence of recombination in almost all CD4−CD8− lymph node cells using either the βgeo or the YFP reporters (data not shown). We therefore examined reporter expression in non-T cells (specifically NK cells, B cells, and monocytes) in all four lines of mice. Whereas recombination in lines 3778 and 3779 was specific to T cells, lines 4430 and 3785 exhibited a more promiscuous pattern of recombination (Fig. 4⇑A). Both NK cells and B cells were mutated with high efficiency in line 4430, whereas line 3785 allowed for good recombination in NK cells but only a minor fraction of B cells became YFP+. Approximately one-third and less than one-tenth of monocytes were YFP+ in lines 4430 and 3785, respectively. The high frequency of YFP+ B cells evident in line 4430 prompted us to look more carefully at the onset of recombination during B cell development in the bone marrow. As shown in Fig. 4⇑B, the frequency of reporter-expressing cells (in this case βgeo-expressing cells) increased in parallel with the developmental maturity of the B cells, rising from ∼20% in pre-B cells to close to 100% in peripheral B cells. These data indicate that line 4430 is useful for efficiently inducing Cre recombinase-dependent mutations in B cells as they develop in the bone marrow. In light of the promiscuous pattern of Cre recombinase expression in hemopoietic cells of lines 4430 and 3785, it was important to look more generally for evidence of recombination in some of the other tissues in the transgenic mice. For this purpose, we isolated genomic DNA from the livers, hearts, kidneys, and brains of mice of the different lines. We then tested the DNA using a PCR assay that could distinguish between recombined and unrecombined alleles of the YFP reporter allele (Fig. 5⇓). As expected, control DNA lacking the YFP reporter allele did not give a signal using this assay. Tail DNA from a reporter transgenic mouse lacking a cre transgene gave one product of ∼520 bp as a consequence of amplification between the UPS and PGK primers. As a positive control, spleen DNA from a 3779/reporter mouse gave two bands, one of ∼520 bp from unrecombined alleles in this tissue, and another of ∼620 bp from recombined alleles (due to amplification between the UPS and YFP primers). Whereas lines 3779 and 3778 reproducibly failed to show evidence of significant recombination in these other tissues, kidney and liver DNA from lines 3785 and 4430 both allowed for weak amplification of the ∼620-bp product derived from recombined alleles. Further work is required to determine whether the recombined alleles in these tissues are present in cells of hemopoietic or other origins. The hearts and brains of all transgenic mice were negative for recombination using this PCR assay indicating an absence of generalized Cre recombination in the mice. Detection of recombined and unrecombined forms of the ROSA26-loxP-Stop-loxP-YFP allele in tissues of dLck-icre transgenic mice. The diagram shows the design of the three-primer PCR assay used to detect the two forms of the reporter allele. The bottom panel shows a representative image of an ethidium bromide-stained agarose gel in which the PCR products from the indicated tissues of the different lines of mice were separated. The right-most track shows the banding pattern of a DNA sizing ladder. The two most widely used T cell-specific cre transgenic lines feature Cre expression controlled by the proximal promoter of the Lck gene or regulatory elements from the mouse Cd4 gene (12, 13). In the former, Cre recombinase expression begins at a very early stage of development, whereas in the latter, the recombinase is induced at a later stage: at or just after the pre-TCR signal has been delivered. In both of these lines, as is also true for hCD2-icre mice (22), Cre-dependent mutations are induced before positive selection occurs. Line 3785 described here showed a pattern of recombination that was similar to that of Cd4-cre in terms of the timing of its onset (13), but it also showed a more promiscuous pattern of recombination than is likely to be the case for Cd4-cre (Figs. 4⇑ and 5⇑). For these reasons, breeding of line 3785 was not continued. In contrast to lines 3785 and 4430, line 3779 showed much delayed onset of Cre expression compared with the existing strains of T cell-restricted cre transgenic mice, with there being little evidence of recombination before transition to the TCRhigh stage of thymocyte development. Line 3778 showed a similar pattern of Cre expression to that of 3779, although fewer cells underwent recombination in these mice presumably because Cre was expressed at lower levels than in line 3779. Only line 3779 was therefore retained for continued breeding. The frequency of mature T cells that had undergone Cre recombination in line 3779 was high: ∼75% in CD4+ T cells and >90% in CD8+ T cells. Hence, line 3779 allows for highly penetrant but nonetheless incomplete recombination in the T cell lineage. A lack of complete penetrance of recombination is obviously a disadvantage in circumstances where a phenotype (e.g., a defective response to a pathogen) can only be revealed clearly by inducing a mutation in all T cells. However, it can be an advantage in circumstances where single-cell assays allow for mutant and wild-type cells present in the same animal to be distinguished from one another. Chimerism due to a lack of complete penetrance of recombination generates internal control populations against which mutant cells can be compared while also allowing for selective effects of mutations to be revealed. The high penetrance of recombination evident in multiple hemopoietic cell types in line 4430 may make this line attractive for some experimental purposes. The efficiency of Cre recombination in the B cell lineage in these mice was equivalent to that previously described for Cd19-cre mice (23), but of course line 4430 showed a more promiscuous pattern of recombination. The expression of Cre in NK cells may be a useful and somewhat distinctive attribute of this line, though at this point it is unclear whether recombination occurs in multipotential precursors of NK cells or in the differentiated cells themselves. In conclusion, by screening a collection of dLck-icre transgenic lines, we have identified one in particular (line 3779) that is attractive for mutating loxP-modified genes selectively from a late stage in thymocyte development. This line should allow for loss or gain of function effects to be induced after positive selection has occurred: in single positive cells or in peripheral T cells in the absence of complicating effects of the induced mutations on most of thymocyte development. However, it remains possible that this line could induce effects that might compromise negative selection or other medullary processes, including the exit of mature thymocytes from the thymus. On a final note, it is worth emphasizing that in this study we observed a spectrum of expression patterns using the dLck promoter, with only two of 15 founders showing the type of delayed onset of recombinase expression in the thymus that we sought. This observation suggests that transgenes using the dLck promoter are likely to be very sensitive to regulatory influences from the sites in the genome into which they integrate. Thus, although the dLck promoter retains obvious appeal for restricting transgene expression to late stages of development, care should be exercised in screening dLck transgenic lines for promiscuous or otherwise unexpected patterns of expression. We thank members of the Killeen laboratory for helpful discussions and comments on the manuscript, Drs. A. Norment and R. M. Perlmutter (University of Washington, Seattle, WA) for the distal Lck expression vector, Dr. Stuart H. Orkin for the ROSA26-loxP-Stop-loxP-βgeo reporter mouse, and Drs. U. Muller, L. Reichardt and A. Weiss for antibodies. ↵1 This work was supported by grants from the National Institutes of Health (R01 AI39506) and the University of California, Universitywide AIDS Research Program (R99-SF-080). N.K. is a Scholar of the Leukemia and Lymphoma Society of America. ↵3 Abbreviations used in this paper: FDG, fluorescein digalactopyranoside; HSA, heat-stable Ag. Benoist, C., D. Mathis. 1999. T-Lymphocyte differentiation and biology. W. E. Paul, ed. Fundamental Immunology 367-409 Lippincott-Raven, Philadelphia. .
Weiss, A.. 1999. T-Lymphocyte activation. W. E. Paul, ed. Fundamental Immunology 411-447 Lippincott-Raven, Philadelphia. .
Brocker, T.. 1997. Survival of mature CD4 T lymphocytes is dependent on major histocompatibility complex class II-expressing dendritic cells. J. Exp. Med. 186: 1223-1232. Clarke, S. R., A. Y. Rudensky. 2000. Survival and homeostatic proliferation of naive peripheral CD4+ T cells in the absence of self peptide:MHC complexes. J. Immunol. 165: 2458-2464. Kirberg, J., A. Berns, H. von Boehmer. 1997. Peripheral T cell survival requires continual ligation of the T cell receptor to major histocompatibility complex-encoded molecules. J. Exp. Med. 186: 1269-1275. Rooke, R., C. Waltzinger, C. Benoist, D. Mathis. 1997. Targeted complementation of MHC class II deficiency by intrathymic delivery of recombinant adenoviruses. Immunity 7: 123-134. Swain, S. L., H. Hu, G. Huston. 1999. Class II-independent generation of CD4 memory T cells from effectors. Science 286: 1381-1383. Takeda, S., H. R. Rodewald, H. Arakawa, H. Bluethmann, T. Shimizu. 1996. MHC class II molecules are not required for survival of newly generated CD4+ T cells, but affect their long-term life span. Immunity 5: 217-228. Orban, P. C., D. Chui, J. D. Marth. 1992. Tissue- and site-specific DNA recombination in transgenic mice. Proc. Natl. Acad. Sci. USA 89: 6861-6865. Wolfer, A., T. Bakker, A. Wilson, M. Nicolas, V. Ioannidis, D. R. Littman, C. B. Wilson, W. Held, H. R. MacDonald, F. Radtke. 2001. Inactivation of Notch 1 in immature thymocytes does not perturb CD4 or CD8 T cell development. [Published Erratum appears in 2001 Nat. Immunol. 2: 467.]. Nat. Immunol. 2: 235-241. Wildin, R. S., A. M. Garvin, S. Pawar, D. B. Lewis, K. M. Abraham, K. A. Forbush, S. F. Ziegler, J. M. Allen, R. M. Perlmutter. 1991. Developmental regulation of lck gene expression in T lymphocytes. J. Exp. Med. 173: 383-393. Wildin, R. S., H. U. Wang, K. A. Forbush, R. M. Perlmutter. 1995. Functional dissection of the murine lck distal promoter. J. Immunol. 155: 1286-1295. Wang, Q., J. Strong, N. Killeen. 2001. Homeostatic competition among T cells revealed by conditional inactivation of the mouse Cd4 gene. J. Exp. Med. 194: 1721-1730. Mao, X., Y. Fujiwara, S. H. Orkin. 1999. Improved reporter strain for monitoring Cre recombinase-mediated DNA excisions in mice. Proc. Natl. Acad. Sci. USA 96: 5037-5042. Srinivas, S., T. Watanabe, C. S. Lin, C. M. William, Y. Tanabe, T. M. Jessell, F. Costantini. 2001. 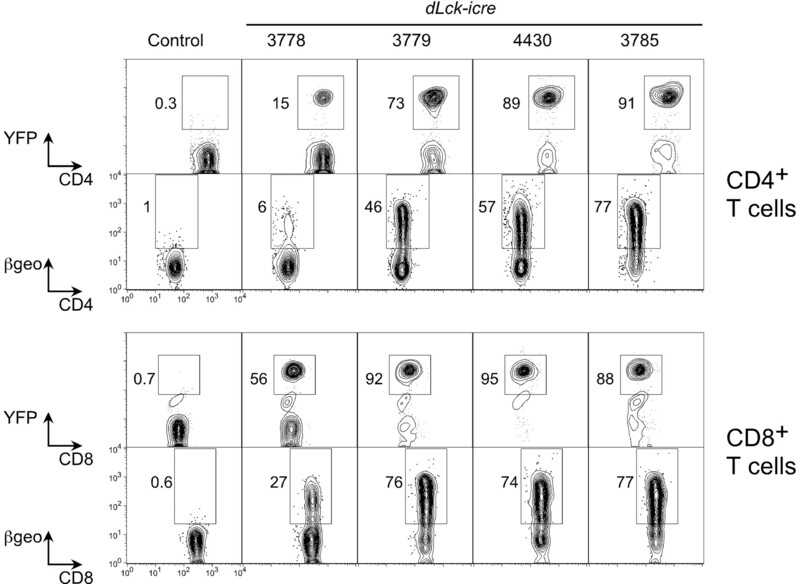 Cre reporter strains produced by targeted insertion of EYFP and ECFP into the ROSA26 locus. BMC Dev. Biol. 1: 4. Friedrich, G., P. Soriano. 1991. Promoter traps in embryonic stem cells: a genetic screen to identify and mutate developmental genes in mice. Genes Dev. 5: 1513-1523. Nolan, G. P., S. Fiering, J. F. Nicolas, L. A. Herzenberg. 1988. Fluorescence-activated cell analysis and sorting of viable mammalian cells based on β-D-galactosidase activity after transduction of Escherichia coli lacZ. Proc. Natl. Acad. Sci. USA 85: 2603-2607. Schwenk, F., B. Sauer, N. Kukoc, R. Hoess, W. Muller, C. Kocks, R. Kuhn, K. Rajewsky. 1997. Generation of Cre recombinase-specific monoclonal antibodies, able to characterize the pattern of Cre expression in cre-transgenic mouse strains. J. Immunol. Methods 207: 203-212.
de Boer, J., A. Williams, G. Skavdis, N. Harker, M. Coles, M. Tolaini, T. Norton, K. Williams, K. Roderick, A. J. Potocnik, D. Kioussis. 2003. Transgenic mice with hematopoietic and lymphoid specific expression of Cre. Eur. J. Immunol. 33: 314-325. Brinster, R. L., J. M. Allen, R. R. Behringer, R. E. Gelinas, R. D. Palmiter. 1988. Introns increase transcriptional efficiency in transgenic mice. Proc. Natl. Acad. Sci. USA 85: 836-840. Palmiter, R. D., E. P. Sandgren, M. R. Avarbock, D. D. Allen, R. L. Brinster. 1991. Heterologous introns can enhance expression of transgenes in mice. Proc. Natl. Acad. Sci. USA 88: 478-482.